One of the most important things you can do on your website is to link out to other sites. It is also important for artists to provide links to the galleries that represent your work. A lot of artists include these links on their contact page or create a special page called Representation. 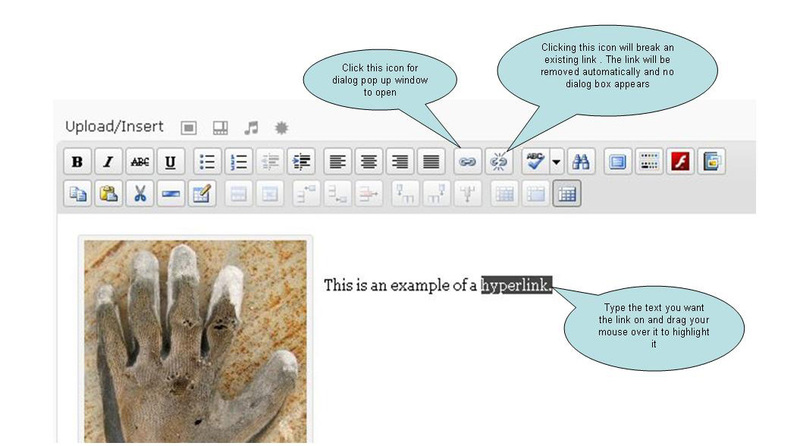 This lesson is for inserting a hyperlink into your text content. See Menus and widgets if you want to add social networking sites or other websites to your sidebar or other available widget areas. There’s also absolutely nothing wrong with linking within your own site. These links make it easy for your readers to get to important information fast. Type the text for the link and drag your mouse over the text to select it. While the text is highlighted go to the editor menu and select the hyperlink icon (looks like a chain). In the pop up dialog box enter the website address you want to link to in the “Link URL” line. Make sure you type https:// in front of the web address so it looks like this example: https://yourlink.com. Provide a link Title to give it meaning (which shows when hovering over the link), and choose whether or not to open the link in a new window/tab or stay in the current window/tab. Once you’re done, click Add Link and the link has been created. It’s always worth testing links in case a mistake was made. WordPress also makes it easy to create links internally within your website. Click on “or link to existing content” and use the search box to find a post or page. When you find the one you want click on it and it will be inserted into the URL box . Many site owners are tempted to open links in new windows, because then it means their site remains in the browser. However, web convention is that a link should keep you in the current window. Otherwise after an hour of browsing, the user could have dozens of windows open that all need to be closed down. In other words, opening a link in a new window is usually an inconvenience for a site visitor. There are some situations where a new window works – usually this is to pop something up where you just know that the visitor will want to quickly look at and then close. Unless you are an avid blogger, having a few links opening in new windows is not a big deal for most artist sites and may actually be preferred. Notice the %20 – this is a HTML space filler. I want the subject line of my link to read website inquiry, with a space between the words. In order to do this and be code compliant, we need to add the space with the HTML %20 (there, you just learned some HTML). 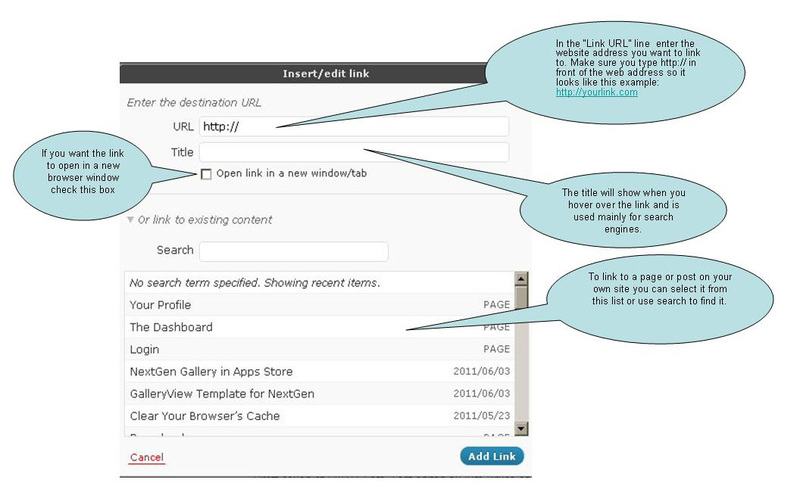 Link Quick Edit: Click on an existing link in the editor and a quick edit icon appears where you can edit the link URL directly or remove the link. Hi Kim, I have successfully added a link to the website. What I am wondering is how to have the phrase “read more here” instead of the full chain. Good for you Brenda. In order to have the link on text such as “Read More”, you need to type the text first, highlight with your mouse and then click the link button and put in the URL.